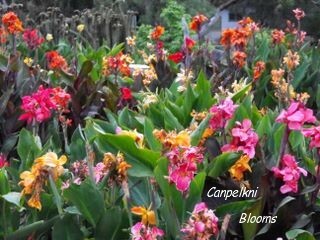 When planting cannas in your home flower garden they will thrive if you start them off with a bit of decent soil, by adding some organic fertilizer such as horse or cow manure. Organic manure will bring in the earth worms, worms are wonderful garden helpers as they aerate and fertilize the soil while keeping it nice and friable, cannas and other garden flowers perennials will thank you for it. Planting Cannas, How to, How Deep? Place the canna rhizome in a well dug over hole, mix some organic manure through, place the rhizome in so its new eyes will sit just under the original soil level, an indication of how deep to plant is that the new eyes will be white if they haven't been exposed to the sun yet. 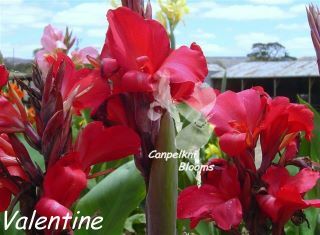 Some canna varieties are flushed with a pale purple color instead of white on the rhizome, once the eyes have broken through the soil or mulch the color will change to that of its leaf color. 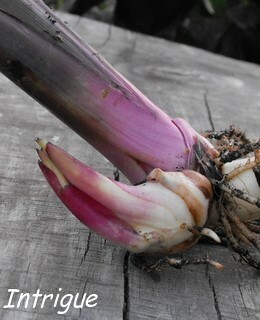 This is canna Intrigue, notice how the rhizome has split and sending up two new shoots. The old brown roots on this canna rhizome will cease to grow any longer however they will produce more fine feeder roots. Here you can see some green on the stem where the original planted level was, it was over three inches under mulch to where the first highest root came from. When planting cannas you can’t do it wrong, even if you plant them on their side, the eyes will turn and head upwards towards any light and the warmth from the sun. 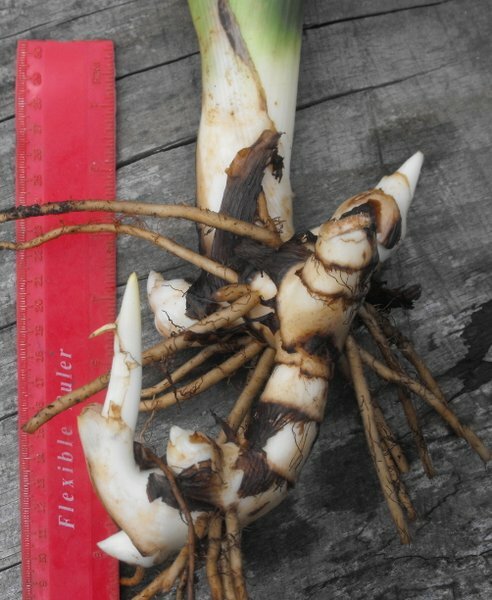 New white roots these will help to stabilize the plants, the roots that are going to keep your six foot tall canna plants from flopping over when its grown up will come from those new eyes and a few from the rhizome leading up to the eyes. Once planted firm down gently if there are new eyes are under the soil, then give a through watering, and mulching cannas will make a big difference if you’re in an extreme hot summer. 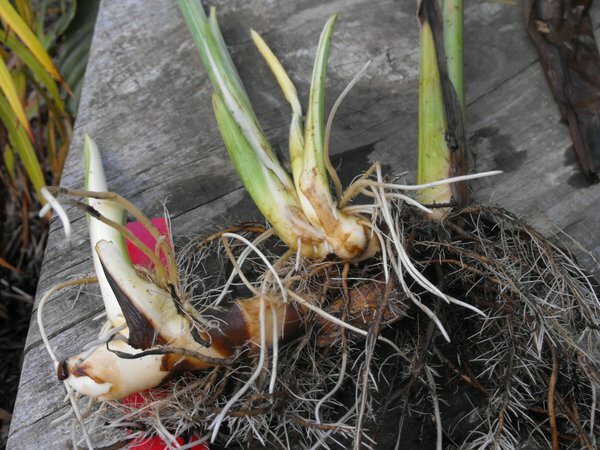 When I’m planting cannas I like to leave the plants for a few days to a week for them to settle, the fastest way to kill any plant is by over watering, especially if you have a small canna division to start with, as the rhizome feeds the plant so it’s best to start with a good sized rhizome. 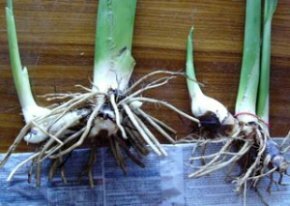 Planting cannas is the same for dwarf and tall types, even when potting cannas you can just plant them all the same way. I usually come back in a week and give a gentle tug on the plant, if it has a slight pull or you can feel it lifting then it hasn’t started re-rooting yet. Push a finger into the soil and feel for moisture, if it’s really dry then give a through watering. Most varieties of cannas will resettle fast while a few others may take a little longer, only when they have resettled and re-rooted do I increase the water.